Finance and international business now constitute the largest sector of Bermuda’s economy. The primary types of commercial vehicle available in Bermuda are exempted companies, partnerships and trusts, including special purpose trusts (which may be established for non-charitable business purposes), limited duration companies and private trust companies. Bermuda has earned a reputation as a world-class centre of commerce, featuring a business-friendly environment, a stable and growing economy and an unmatched collection of talent and intellectual capital in key sectors, including insurance, financial services and, more recently, electronic commerce. The Bermuda Government works closely with Bermuda’s international business community to develop laws & regulations that enhance the business environment in Bermuda. Similarly, Bermuda’s telecommunications infrastructure and high technology backbone provide maximum bandwidth, with full redundancy, to the island, enabling Bermuda to accommodate rapidly growing global electronic commerce and communication services. As one of the world’s leading Insurance/Reinsurance and financial centres, with the captive insurance sector being the largest in the world, Bermuda is also a jurisdiction of choice for funds, asset finance and for incorporating global companies seeking to list on internationally recognised stock exchanges. Bermuda’s legal system is based on English Common law. It’s primary legislation consists of statutes passed by the Bermuda Parliament however certain UK Acts apply to the extent that they have been specifically extended to Bermuda or have survived to the extent that other sources have not changed it since the laws of England and Wales originally became Bermuda law in 1620. The courts apply the general principles of English common law and equity together with the common law of Bermuda, with a final right of appeal to the Judicial Committee of the Privy Council. No Bermuda income, corporation or profits taxes, withholding taxes, capital gains taxes, capital transfer taxes, estate duties or inheritance taxes are payable by an exempted company or its shareholders, other than shareholders ordinarily resident in Bermuda. An exempted company is not subject to stamp duty on the issue, transfer or redemption of its shares. The Ministry of Finance has issued a certificate guaranteeing the continuation of the no-tax situation until 2035. Bermuda is ideally located between Europe and the United States. It offers a convenient time zone, 4 hours behind London and 1 hour ahead of New York and Toronto, and provides easy access to major airports on both sides of the Atlantic. Regulatory statutes governing the principal financial services in Bermuda, including banking and deposit taking, insurance, investment business, trust business and private and public mutual funds are regulated by the Bermuda Monetary Authority. The island offers international companies a sophisticated high-tech infrastructure and is rich in intellectual capital. Bermuda is on the OECD “white list” as well as being a member of the International Organization of Securities Commissions (IOSCO) and is widely regarded as one of the highest quality offshore jurisdictions. 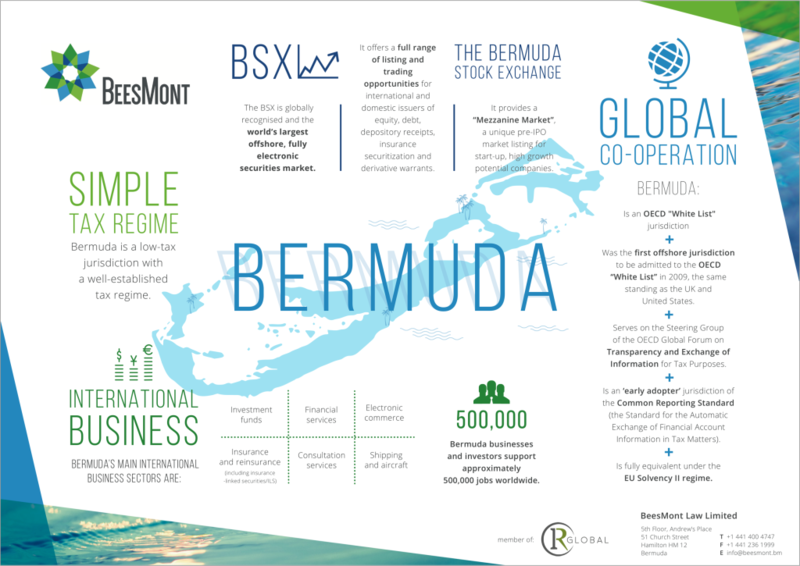 The Bermuda Stock Exchange (BSX) is the world’s largest offshore, fully electronic securities market offering a full range of listing and trading opportunities for international and domestic issuers of equity, debt, depository receipts, insurance securitization and derivative warrants. The BSX’s significant growth over the last several years is due in large part to the company’s innovative and flexible approach. In addition to taking a leading role in what has become a world trend towards profitability and demutalisation, the Exchange has sought to create unique products and services for its niche offshore market. A case in point is the Exchange’s “Mezzanine Market”, a unique pre-IPO market listing for start-up, high growth potential companies. Unlike AIM in the UK or the European Neur Market, the BSX Mezzanine Market offers development stage companies the opportunity to list on a recognized international stock exchange without having to commit to a full IPO. This is largely due to the fact that the BSX restricts Mezzanine Market investment to ‘Qualified Investors’. This means that access is limited to intuitional and or sophisticated investors only in this way, the BSX can rely more on full disclosure than prescriptive regulations for investor protection purposes. In addition to the Mezzanine Market the BSX supports an active domestic market that trades daily, Monday through Friday and a robust after-hours crossing market for large institutional block trades. It is one of the world’s leading listing facilities for offshore funds and alternative investment vehicles and supports niche markets for specialized insurance and debt products. As a full member of the World Federation of Exchanges (formally the FIBV) the BSX has been acknowledged by its peers to meet the highest regulatory and operational standards. Similarly the US Securities Exchange Commission recognises the BSX as a ‘Designated Offshore Securities Exchange’ (DOSM) and the UK Financial Services Authority (FSA) recognises the BSX as a ‘Designated Investment Exchange’ (DIE).